DEFENDING OUR PRACTICE AND PROFESSION: Where we’ve come from, where we are now and where we’re going. Everyone wishing to get involved is welcome to attend. 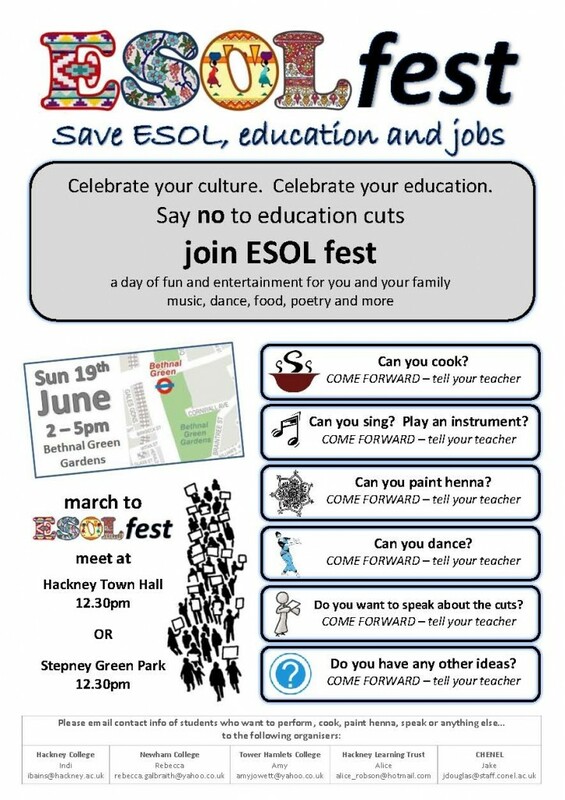 The east London fest will meet at Hackney Town Hall 12.30pm OR Stepney Green Park at 12.30pm to march to Bethnal Green Gardens for an afternoon of celebration and activities from 2-5pm. And at the sister event in south London meet at Windrush Square in Brixton at 12pm to march to Kennington Park for 2pm. Afternoon activities will include music, dancing, food, speakers, henna tattoos, and lots of other activities.Please post the 2 flyers advertising this event around your college and ESOL departments to get more people to come forward and get involved. ESOL Issues and Action for ESOL were prominent at UCU Congress held at the end of May. The following motions were passed at the FE Sector Congress and at the full Congress. Mandy Brown also spoke about the Campaign and ESOL issues at a very well attended Fringe meeting on multi culturalism at Congress. Both the UCU President Alan Whitaker and Sally Hunt also made reference to the ESOL campaign in their speeches to Congress. Conference calls upon FEC to join the national campaign to save ESOL from the proposed government cuts. Conference congratulates the Action for ESOL campaign and fully supports its demands for: 1. Fully funded English language provision for all who need it and cannot afford to contribute to the cost. 2.People on non-active benefit, those on low incomes and asylum seekers to continue to have access to free provision. 3.The continuation of the ESOL element of the Learner Support Fund. 4.The preservation of ESOL teachers’ jobs. Conference instructs the FEC to continue to support the Campaign in all appropriate ways, including organising a national campaign to raise awareness about the impact of these cuts to ESOL both with members and the wider community and further to organising a lobby of Parliament to call this ConDem Government to account. Congress Motion 41. ESOL and adult and community education Congress condemns the funding cuts to Adult and Community and ESOL provision and calls on Congress and the NEC to send a message to the government and political parties to express our extreme concern at the damage these cuts will inflict on the well-being and cohesion of communities. In 2006 it was estimated that in London 600,000 people had an ESOL need, elsewhere as many as 50% of adults have entry level ESOL needs. The funding of ESOL and Adult and Community Education is an essential educational service. Congress notes the successful campaign involving staff, students and communities built around the slogan ‘Defend ESOL, Defend Education’ and urges the NEC to use this model in encouraging similar campaigns and the reformed Defend ESOL campaign alongside other interested parties in the Campaigning Alliance for Lifelong Learning (CALL) to develop resistance to these devastating cuts locally and nationally. UCU Senior National Education Official FE and Lifelong Learning, Carlow St, London N1 7LH. Direct telephone: 0207 756 2591. Mobile: 07977132008. Cost: Free. All are welcome. Action for ESOL is a coalition of teachers, students and others who came together in early 2011 to resist the threat of massive cuts to ESOL funding. Since then, thanks to a lively and creative campaign, we have made the case against these cuts and highlighted the devastating impact they will have on current and future students. 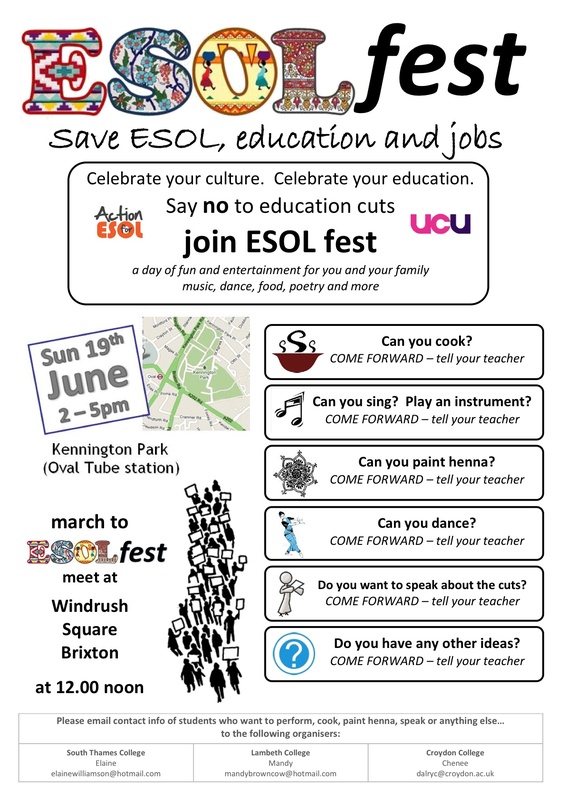 But Action for ESOL has also argued that the cuts will put at risk what we have gained in ESOL thanks to the hard work of teachers, teacher trainers and researchers over the last few decades. They will undermine a still evolvingESOL infrastructure and disperse our professional expertise – indeed, the anticipation of reduced funding is already leading to threats of redundancy in many colleges and adult education providers. Action for ESOL recognises that the struggle to defend provision for ESOL students is also a struggle to defend (and promote) the integrity of ESOL as a distinct area of language education and the professionalism of its practitioners. 1.Where have we come from? Was there life before Skills for Life? What issues have persisted in ESOL over the years? 2.What have we achieved and what do we stand to lose? What have we gained from Skills for Life? And what were the pitfalls – and how can we resist them? 3.If these cuts go through what will ESOL look like? Is there a future for ESOL in FE? What is the relationship of ESOL with literacy teaching? Family learning? What about the role of the voluntary sector? 4.Where should we be going? What kind of ESOL sector would we like to nurture and promote? How can we really meet the ‘needs’ of ESOL students? What is the role of popular education and radical pedagogies such as Reflect in ESOL? What is the relationship between teaching and political action?